How do I create and manage custom user roles in my account? The default permissions for each user role have a certain degree of customization that is allowed. 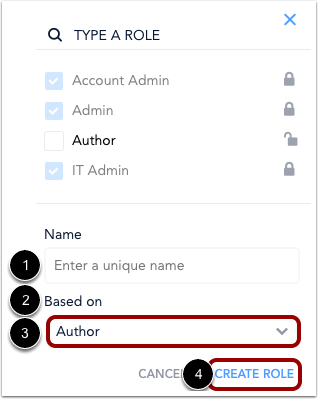 Account admins can create custom roles based on an existing default user role, and the custom role will inherit the default permissions of the user role it is based on. Custom roles can be used to modify default roles without any restrictions. Custom user roles can be deleted; however, default user roles cannot be deleted. 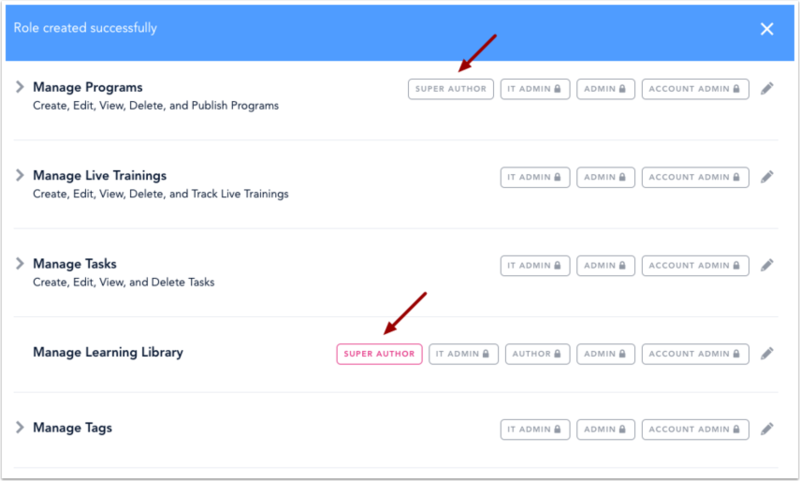 Account admins can assign and modify user roles to learners on the Users page. Admins can limit a manager’s default permissions but cannot give the manager role additional permissions. Additional permissions can only be given to managers by assigning them an additional role like admin or account admin. Learn more about using Bridge as a manager. Learn more about roles and permissions in Bridge. In the Users and Permissions menu , click the Roles and Permissions link . Click the Edit icon next to any permission to create a custom role. Note: It does not matter which permission you edit to create the custom role. You will still need to assign the role to the permissions you want the role to have. Click the Create Custom Role link. In the Name field , enter a unique name for your custom user role. In the Based on drop-down menu , select the user role  you want to base the custom role on. All custom roles that are created are based on an existing default user role, and the custom role will inherit the default permissions of the user role it is based on. When you're done, click the Create Role link . 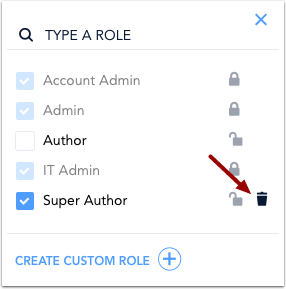 The custom role will be automatically added to all the default permissions of the user role you based the custom role on. 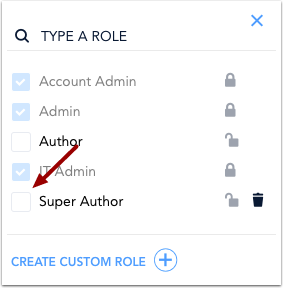 In the example above, a Super Author custom role was created based on an Author role. View the default permissions in Bridge. Once you have created a custom role, you can add it to as many permission groups and/or individual permissions you want. Custom roles can be used to modify default roles without any restrictions. To add a custom role to a permission, locate the permission or permission group and click the Edit icon. Click the checkbox next to the custom user role. If you are adding a role to the permission group, the role will be added to all the permissions within the group. If you are adding a role to an individual permission, the role will be only be added to that permission. To edit custom roles, click the Edit icon. To remove a custom role from a permission, click the checkbox next to the custom role you want to remove. If you are removing a role from the permission group, the role will be removed from all the permissions within the group. If you are removing a role from an individual permission, the role will be only be removed from that permission. 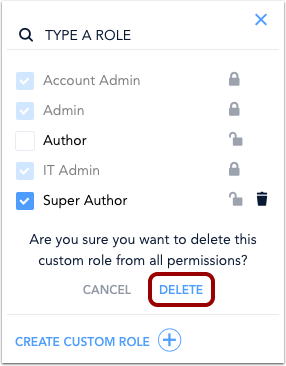 To delete a custom role from your account and all permissions, click the Delete icon. Note: If a user only has a custom role in Bridge, and the custom role is deleted, the user will default to a learner role. The user will not be deleted from your account. Click the Delete link to confirm. Previous Topic:How do I manage user permissions in my account? Next Topic:How do I edit user role permissions in my account? 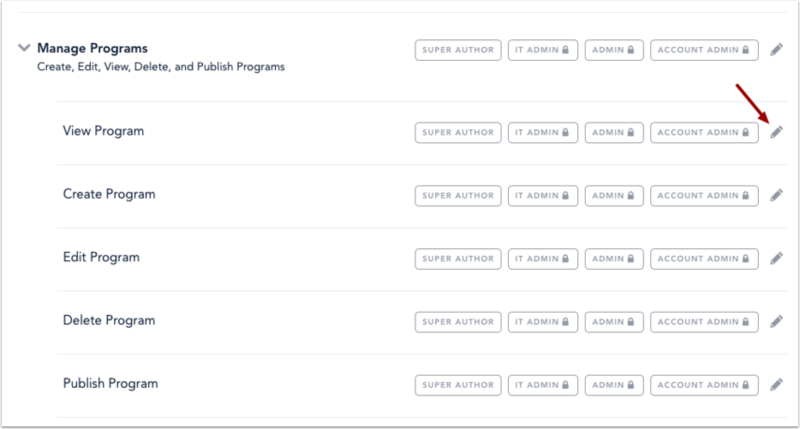 Table of Contents > Manage Account Settings > How do I create and manage custom user roles in my account?